The bizarre clone of Superman has finally found the real deal. And the timing couldn't be better for Solomon Grundy. Now, a three-way-fight for dominance is about to erupt with dozen of civilians caught in the middle! The better portion of this issue is taken up by a massive fight scene. And it's a darn good fight scene, as far as these things go, with Iban Coello and J. Nanjan blocking and rendering the whole affair beautifully. Yet Brian Buccellato's script doesn't let the action dominate the story. 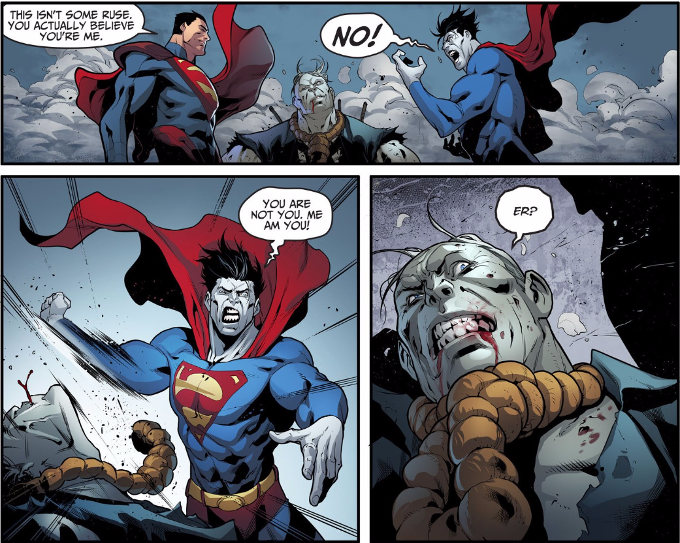 There's also a number of small character moments that show that as far gone as Superman is now, his first priority is still protecting the innocent.